Pressure cookers are back again, and BELLA, a reputable brand for making kitchenware, has brought a unique cooker with amazing features. BELLA 6 Quart Pressure Cooker not only does work as a steamer but also function as a slow cooker. It can also sauté or brown food. Other presets include pressure-cooker modes for rice, soups, stews, and risotto, as well as meat and chicken. With a generous capacity, this pressure cooker can be used to serve a substantial family of 4-6 people. According to the manufacturer, this BELLA 6 Quart Pressure Cooker cooks 70 percent faster than conventional cookers. With just a touch of a button, you can cook safely and easily with this 6-quart pressure cooker. It features the latest technology, and thus you will find it highly convenient. You can cook full chicken, fish, soup, or anything within minutes. This cooker provides perfect pressure which enables it to cook food to perfection. BELLA 6 Quart Pressure Cooker features ten preset functions that allow you cook different types of meals. 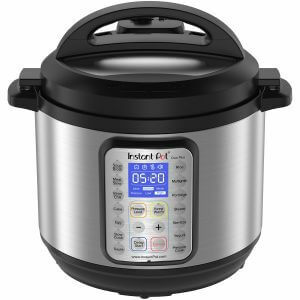 Unlike most cookers which don’t have many pre-set functions, BELLA 6 Quart Pressure Cooker offers ten functions that you can use to pressure cook, stew, sauté, meat, slow cook, chicken, brown rice, and anything with just one touch. These make it a versatile appliance to have in your kitchen. 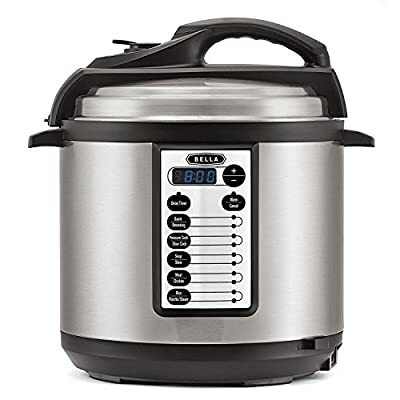 This 6-quart pressure cooker from BELLA features unique searing technology. As a result, you can sear and brown your food using this pressure cooker. It locks in flavor and juices in your food making it more delicious. The cooker is designed in such a way that you can cook a wide variety of food with a perfect taste and flavor. When choosing a pressure cooker, safety is one of the main consideration as not all pressure cookers have safety features. BELLA 6 Quart Pressure Cooker has several safety functions. It has a steam release valve that enables it to discharge excess steam. Also, it has an airtight locking lid that holds everything in place. And finally, it comes with a safety-minded user interface. Therefore, no technical failure will happen when you are cooking with this appliance. It safely allows you cook your favorite food up to 70 percent faster than conventional cookware. You don’t have to wait for hours for your chicken to cook. With this appliance, cooking just got easier. It features ten preset functions that allow you to cook different foods to perfection. You only need to toss in your ingredients, lock the lid, and press one button. This versatile cooker introduces you to a whole new world of hundreds of recipes. From soups to desserts and ribs to chicken; all these can be cooked in less than an hour with just a push of a button. After purchasing this appliance, you will be directed to a dedicated site of recipes to help you get started. Brown and sear your foods using this pressure cooker for extra flavor to all your meals. It locks moisture and flavor making your food soft and delicious. From an airtight locking lid and a steam release valve to a safety-minded interface, you are 100 percent assured of your safety when using this pressure cooker. BELLA 6 Quart Pressure Cooker features a non-stick inner cooking pot that is removable. It has a moisture catching container to make cleaning up this appliance a breeze. This cooker also comes with a measuring cup and a rice paddle. With BELLA 6 Quart Pressure Cooker you can cook different types of meals in a short time. This model can cook food 70 percent faster and features 10 preset functions for cooking your favorite dishes. Plus, you can set it to keep warm your cooked food or delay cooking. To ensure your safety while using this appliance, this pressure cooker features various safety features. Cleaning its cooking pot is also a breeze.